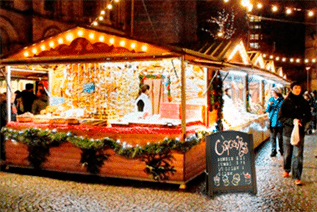 Christmas Market – A Must Read For All Retailers/Printers & Sign Shops! Christmas may seem like a long way off. The school summer holidays are over, a sigh of relief from parents can be heard sweeping the country. Most of us have returned from that well deserved holiday we have been promising ourselves since last year, and Christmas is the last thing on most people’s minds. Except, now businesses up and down the country are busily preparing themselves for the festive crowds and crazed Christmas shopping. 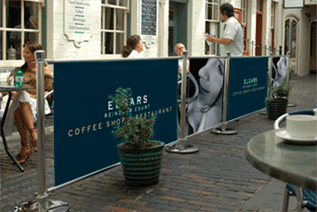 As part of the companies planning, advertising will be high up on their agenda – meaning new display, signage and café barrier systems will be required to help their Christmas marketing be a success. Now, when you break down the planning for the festive season like that, suddenly it doesn’t seem all that far away does it? From November onwards Christmas fairs and Christmas market stalls will be busily being set up in most major towns and cities. The markets bring more visitors into the town purchasing a wide variety of goods or services on the run up to Christmas. 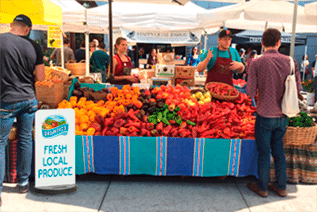 These markets also help to boost retail shops sales due to the sheer amount of visitors perusing the stalls, area and town. It has been said that despite the challenging economic climate that all businesses have faced, the demand for trading, setting up new Christmas markets and visiting the markets does not show any sign of slowing down. 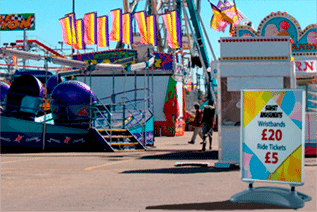 The various fairs and markets help connect market organiser partners, traders and suppliers whilst also enhancing the visitors to the markets overall experience. With the large crowds and amount of stalls making your stand eye-catching and appealing is vital, so a range of display or signage could help you to achieve this. Now, as stated earlier, the extra visitors to the town also proves to boost retail shops profile, and increase their sales too. So not only is it important that stall holders make an impact with their display and signage, the same can also be said for retail shops too! Here are some examples of how the Plex range could enhance your advertising and marketing.